Thin-walled structures can be used to absorb impact energy during a vehicle collision. 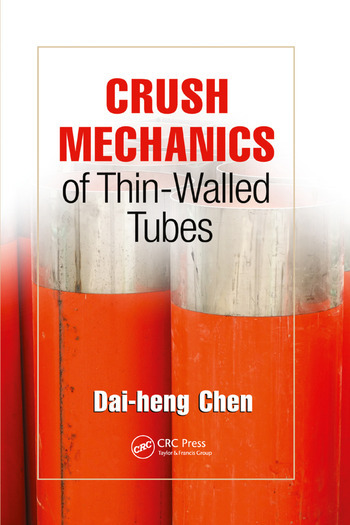 Crush Mechanics of Thin-Walled Tubes describes the analysis and design of these lightweight elements and thoroughly explains the deformation behaviors of thin-walled hollow members under crushing loading. The book covers, in detail, thin-walled structures—under axial compression, bending, and torsion. It provides a complete understanding of the underlying concepts and mechanisms of energy absorption components, includes analysis techniques, and covers existing theoretical approaches along with the author’s research. A shelf-worthy reference showcasing structural mechanics, Crush Mechanics of Thin-Walled Tubes provides a basic understanding of the fundamental concepts and mechanisms of crushing deformations in thin-walled structures and serves as a guide for both teaching and self-study. Dai-heng Chen earned his M.S and Dr. of Engineering at Kyushu University, Japan. His professional experience includes work as an engineer at the Wuxi Steel Mill (Wuxi, China), and as a Research Associate, Institute of Mechanics, Academia Sinica; Beijing, China. His academic career includes time at Jiangnan University in Wuxi, China; Kyushu Institute of Technology in Iizuka, Japan; and the Science University of Tokyo, Japan. Currently Dr. Chen serves as a Professor at Jiangsu University in Zhenjiang, China.